One World Trade Center in lower Manhattan, New York, is seen at right on Friday, Nov. 13, 2015. The spire was lit up in solidarity with the people of Paris after a deadly string of attacks. New Yorkers are expressing their grief over the deadly attacks in Paris that have killed at least 129 people and elected leaders are showing their solidarity with France by directing the city's tallest building to light up in the country's colors. Gov. Andrew Cuomo directed One World Trade Center to light up in blue, white and red "as we stand in solemn solidarity with the people of France, just as they have done for us in our own times of tragedy," he said in a statement. "We join them in mourning those who were killed, and in praying for those who were injured or lost loved ones. And we continue to stand side by side with them in our commitment to a free and peaceful world," Cuomo said. The 408-foot spire on top of the building – constructed after a terror attack leveled the twin towers on September 11, 2011 – was lit up in the colors of the French flag Friday night, and will stay that way in the nights ahead. The Empire State Building, meanwhile, went dark at 10 p.m. Friday in sympathy with Paris. Other landmarks across the conteninent glowed blue, white and red Friday night, including San Francisco City Hall, the Omni Hotel in Dallas and Toronto's CN Tower, for decades the tallest freestanding structure in the world. At New York's Union Square Park Friday night, dozens gathered to hold a candlelight vigil for the victims of the Paris attacks. They gathered in a circle around a sign drawn on the ground, symbolizing both the peace sign and the Eiffel Tower, holding candles and the French flag. 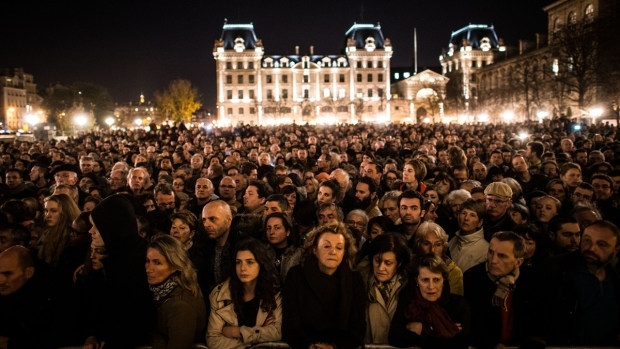 Photos of the vigil were posted to social media with hashtags like #prayers4paris and #newyork4paris. At the French Consulate on the Upper East Side, workers lowered the French flag outside the building as extra police kept watch. People stopped by to leave flowers; one woman was overcome with tears as she lit a candle to leave on the doorstep. "First it gripped me. Now I'm angry and saddened and I want to pay homage to the French people, all the lives lost senselessly," said Theresa Thomas, who lives on the Upper East Side. Mayor de Blasio also released a statement saying: “The people of New York City are heartbroken to see our sister city of Paris shaken again by these thoughtless acts of violence, and we stand in solidarity with the residents of Paris and with Mayor Hidalgo during this tragic time." Eight attackers targeted at least six locations in the French capital, authorities said. Police said they killed one of the terrorists and the others blew themselves up. Dozens of people were killed inside a Paris concert hall called Le Bataclan where an American rock band was playing, and more were killed in shootings and explosions at other sites across the city. Americans were among the over 250 who were wounded in the attacks, the State Department said on Saturday. "These were cowardly acts of evil by people who have inexplicably chosen to believe in radical hatred above all else," Cuomo said. "We reject that kind of extremism – choosing instead the bonds of liberty, equality and fraternity that bring us together." French President Francois Hollande vowed a "merciless" response against the perpetrators, as ISIS claimed responsibility.